The postal service in New Zealand has been in existence since at least 1831 and possibly earlier. During 1831 the Postmaster-General of New South Wales commissioned a merchant from the Bay of Islands to receive and return postal mail. Governor William Hobson introduced rules concerning various postal matters, even though the British government was to retain control until 1848. Initially, there were very few post offices established but by the mid-1850s Postal services were greatly expanded. The Local Posts Act of 1856 allowed for Provincial Governments to establish post offices; followed by the Post Office Act of 1858, which called for re-organization of the postal services, overseen by a Postmaster-General. It was around 18 – 20 July 1855 when postage stamps were first issued for New Zealand. The design was the “Chalon head” stamps, which depicted Queen Victoria. This design was based on a full face portrait by Alfred Edward Chalon, and showed the Queen in her state robes for her coronation in 1837. The Chalon head has also been called a ‘full face’ image due to the fact that the Queen appeared to be facing full-on which was unusual for the time as figures were usually pictured in profile. These stamps were initially printed in London without perforations and then hand cut from sheets by postal clerks. 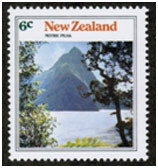 Later printings were made in Auckland and are considered different stamp issues from the originals. From 1862 onwards however, the sheets of stamps were fed through perforating machines to create perforated stamps. The quite rare London printing of this stamp would be a fabulous (and expensive) acquisition for any collector of New Zealand stamps. New Zealand issued a long pictorial set of stamps in 1898 depicting many famous local landmarks followed by similar issues in 1935 and 1940. With the advent of the post WWII era New Zealand stamps have become quite colorful and recorded events such as the change to decimal currency in 1967, Maori Leaders in 1980, Rugby World Cup in 1991 and Millennium 2000 issues in 1999 and 2000.